can you make it so people can’t subscribe to you? Why isn’t t-mobile on there??? I use t-mobile so that means I can not use sms??? So if a friend has not restricted their status updates and links then you can subscribe to them via SMS? I take it that if they restrict those things then the subsciption option would not be available to those that they blocked updates from? If one of my friends subscribed to my facebook statuses via sms, will they still get texts of my statuses after I remove them from my facebook friends? Once I subscribe to someone’s status updates by SMS, is there a way to unsubscribe if I don’t want to receive them anymore but STILL want to be friends? I live in Greece. When a friend of mine changes his status (in Greek), I receive an sms like “?????? ?????? ?? ????????? ???? ?????”. Meaning, there is a problem with the encoding (non latin letters)? I asked Facebook about this and they told me that is a problem concerning my mobile provider. I asked my provider and they told me that it’s Facebook problem (which I believe it is). So, is there a solution about this? the language or characters not supported on your phone. I subscribed to SMS to get one friend’s updates, last Friday. I haven’t received ANY of her updates since. Does this mean I’ve been blocked from receiving her news updates? Tonight I saw that some of my friend’s most personal writings had been posted on her facebook page, under “Web Results.” Did she voluntarily do this, or did Facebook just post these on their own? how can i tell whose statuses i have subscribed to? i found that i must have accidentally hit the subscribe button on one friend’s page and i want to be sure that i havent subscribed to anyone else. Is there still no way to see who’s subscribed to my status Via SMS? Are there external apps for this now? Me either….I have recently been subscribed to someone’s status updates but I don’t know how I actually done it. I want to unsubscribe because all of their updates irk me. How do I find out who everyone you have subscribed to? Once you've signed into Facebook, if you navigate to http://www.facebook.com/friends/?filter=ms, you will see a list of people to whom you have subscribed. Does this still work? I do not see a listing of SMS subscriptions. I cannot find a way to add “Subscribe via SMS” to my profile and I read your response stating that this feature has to be turned on via Facebook. I am having a difficult time searching through Facebook's numerous questions through their “Help” center and cannot find a way to contact someone who actually works (if you will) for Facebook. Any suggestions? Is there a way to contact Facebook directly? It seems that a lot of my friends have this feature and I would llike to have this feature as well!!! Thanks!!! 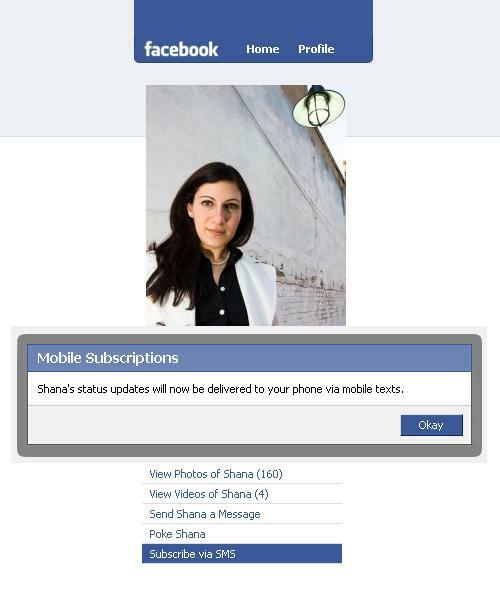 The “Subscribe Via SMS” option will not be shown to you when you are looking at your own profile. However, others will be able to see it when they are on your profile and, similarly, you will be able to see the “Subscribe via SMS” option on others' profiles. even though you don't subscribe your friends via sms…how come your still getting there status updates? is there a way that even though your friends don't subscribe you that they can still receive text messages of your status updates? Why would I stop receiving SMS status updates for a friend on Facebook when they are still in my SMS list and their wall shows “unsubscribe” which would mean you are subscribed? How do i in jus one click subcribe to via sms for all my friends on facebook? You would have to subscribe to each person individually. Thank you! I was going crazy trying to figure out the “SMS” thing until I read your post. how can you find out who subscribe's to your own facebook page??? lik i want to know if my ex is trying to check up on me. Is there a way to subscribe to when my friends comment on their own status or picture? For example I comment on their status is there a way for me to recieve a text that they have replied? No, but you can chose to receive an e-mail when that happens. Check out the Facebook notification settings page here: http://www.facebook.com/editaccount.php?notific…. I want to receive replies from status update after I have reply, is there a way? When facebook messaging to mobile, I can receive what friends wrote and I can reply and we can have a conversation that way. I want to do the same with facebook statuses so I can reply to friends or other people that are commenting on it instead of just sending one text to the update and not knowing what the reply I got. I want to add someone to a specific list, but it keeps going to a SMS link on the left side of my page under lists. How do I ge rid of that list? You won't be able to see the “Subscribe to SMS” link on your own profile, but others should see it. It costs the same as receiving an SMS. why are my replies going to messages and not on the comment wall? There is not additional cost to receive status updates by phone… You will be charged the same as receiving a regular SMS. When I recieve my subscibed friends' status updates, it says “reply to comment, or 'like' to like. I thought i had been sending status comments and likes as well but it turns out almost everything i reply to status update texts turns out to be to be sent to the person as a message. How can i comment status' and like them as well when i get an sms that someone updated? Every time I try to like a status or something other, or comment it, it sends them a text message. Halp? Er, it sends them a regular message. when they send me messages saying so and so has sent you a message on facebook, if you reply to them viar text does it cost? If someone is subscribed to your statuses, and you delete them as a friend and block them from facebook, will they still receive your status updates? On my profile, I can’t see my list of SMS Subscribed friends. Do you know where to find that? i cant subscribe to anybody – its just not an option anywhere? How do I subscribe people to my Facebook SMS Subscription ? my friend did it a long time ago by going to his/her friends list and making a list called like SMS Subscription or something. does that still work ? How come when I visit my facebook page, I see squares at the beginning of my text message replies? okay so i have facebook right? and i subscribed my friends, their statuses go to my phone & i reply. but when they reply, it doesn’t send to my phone. how do i change that, to make it able to come to my phone with any replies to the status? I use to be able to view a list of friends, and click one by one who I want to get text updates from. Now that list is gone, and I have to do it one by one on their pages. why did this change? how do i unsubscirbe someone ?!! How do you subscribe or unsubscribe via sms on the new 2010 layout? Can’t find links anywhere. how do i unsubscribe someone’s facebook status with the new profiles on facebook? I have noticed that all of my friends who have gone to the new Facebook format, without exception, appear to have “Subscribe via SMS” unavailable. Is it turned off by default in the new format, or is that feature just being phased out? Facebook “help” seems to have no answers for this. I am trying to figure out how to unsubscribe to someones status updates but with the new layout I can’t find subscribe or unsubscribe or anything about it for that matter…Please help!